You may need a stocking for all those stuffers! 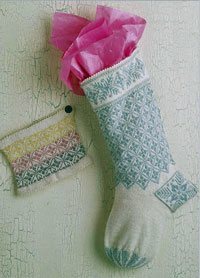 What better way to continue on with the holiday spirit than to start working on a stocking for Christmas for yourself or as a wonderful gift! Donna Kay combines soft shades of alpaca yarn with three traditional snowflake patterns and silver-lined glass beads to give this Christmas stocking an elegant Victorian look. The beads are strung on the yarn before the knitting commences, then the piece is worked in the round from cuff to toe, except for the heel flap, which is worked back and forth and joined with Kitchener stitch. Finished Size: About 7 3/4″ (19.5 cm) wide at top, 16″ (40.5 cm) long from top to heel, and 12″” (30.5 cm) long from heel to toe. Needles: Size 2 (2.5 mm): 16″ (40-cm) circular (cir). Size 0 (2.0 mm): 16″ (40-cm) cir and set of 4 double-pointed (dpn). Adjust needle sizes if necessary to obtain the correct gauge. Notions: Markers (m); waste yarn; 250 (5-mm) clear beads with silver lining; sewing needle and thread; tapestry needle. Congratulations to Knots of Love for such an incredible accomplishment in passing their 100,000 cap milestone!! As of today, the cap count is up to 101,633! 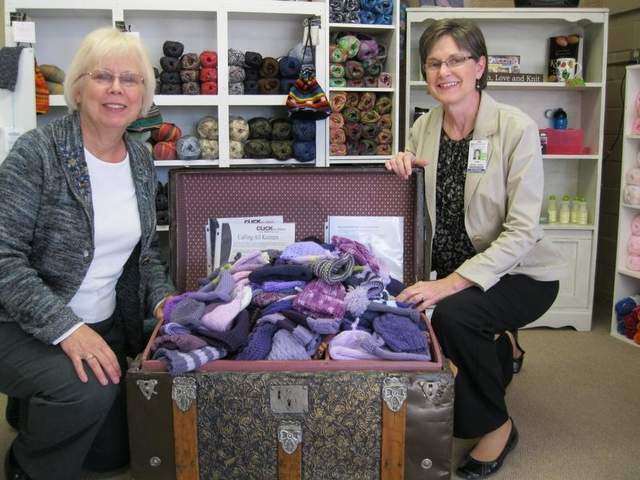 Knitters in Des Moines, Iowa have dedicated their time and skills towards a great cause this November. In order to raise awareness for Shaken Baby Syndrome, every baby born in the metro area will be sent home from the hospital with a hand-made purple knitted cap. Thanks to the partnership of Knitting Next Door and Blank Children’s Hospital, over 180 caps were donated for this great cause! Click here to read the rest of the article.